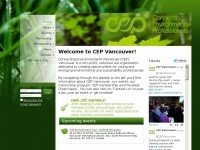 CEP Vancouver is an organization dedicated to connecting environmental professionals through initiatives such as the CEP mentorship program. three profiles were found for Cepvancouver.org in social networks. Among other social networks the website is represented in Facebook, Twitter and LinkedIn. The web server used by Cepvancouver.org is run by Merit Network and is located in Ann Arbor, USA. There are many websites run by this web server. The operator uses this server for many hosting clients. In total there are at least 410 websites on this server. The language of these websites is mostly english.